When rules governing postal deposits are changed through a gazette notification about which neither the government official nor the consumer is aware, how would it affect the investor? Case Study: Arulmigu Sri Sankaranareyanan, a charitable trust, placed a deposit of Rs 50,000 with the Kovilpatti Post Office in Tamil Nadu on 21.9.1996. The deposit was accepted by the postal department even though it was in contravention with the Post Office Savings Bank General Rules which debarred institutional investments in Post Office Time Deposit Accounts. The mistake was detected by the postal authorities in mid-August,1997. The postal department then sent a letter to the trust on 24.12.1997, asking it to close the deposit account. As a special case, the postal authorities offered to pay a interest of 3% per annum. The trust did not respond and instead approached the District Forum by filing a complaint against the Union of India through the Superintendent of Post Offices. The case was contested, stating that the interest was not payable since the deposit was in contravention with the rules. After considering the rival contentions, the forum allowed the complaint and held the postal department liable to pay interest. This order was challenged but the appeal was dismissed. The postal authorities then finally approached the National Commission in revision. The National Commission observed that the earlier institutions were allowed to invest in postal time deposits, which was later disallowed under a notification issued on 8.3.1995. It relied on the Supreme Court’s judgment in Arulmighu Dhandayudhapaniswamy v/s The Director General of Post Offices, Department of Posts & Ors. in Civil Appeal No. 4995 of 2006 decided on 13.7.2011, where it had been held that ignorance of law on part of the investor is no excuse, and it is presumed that the citizen is aware of every notification published in the government gazette. So under normal circumstances, no interest whatsoever—not even the 3% interest offered—would be payable on the deposit since the investment was in contravention of the rules. The national commission also observed that once it was noticed that the investment was contrary to law, it was the duty of the postal department to forthwith refund the principal amount without interest instead of waiting for the investor to close the account. Failure to do so would be a considered a deficiency in service, for which the investor would be entitled to claim compensation. Accordingly, by its order of 11.6.2018 delivered by Justice V K Jain, the National Commission held the postal authorities liable to refund the deposit along with the offered rate of 3% interest from the date of investment till the date when the mistake was detected, and thereafter at 12% per annum from 31.8.1997 onwards. Conclusion: An investor has to exercise caution when investing in government schemes as even though the dealing officials may be ignorant and callous, it is the consumer who has to suffer the loss. From enabling the poor to invest amounts as low as Rs.50, to co-contributing in their investment and encouraging employers to gift a pension, IIMPS is leading the marginalised section of the society towards a better and more secure future. Know more about how this team is working with the government and other agencies to change the lives of millions of people. “I too would like to employ someone to clean my car some day like I do for other people now,” says Gauri, a car cleaner with big dreams in her eyes. Gauri has been working as a house maid and a car cleaner along with her husband for 26 years now. She has a family to support and two kids who are now standing on their own feet. “But I don’t want to be a burden on them. That is why I have enrolled for the Micro Pension scheme, so that I can live my old age with dignity. The money will be of a great help when my husband and I grow old,” she says. Gauri is one of millions of marginalized workers in organized sectors who believed that facilities like pension was something only the privileged class could avail. But thanks to Gautam Bharadwaj and his social enterprise Invest India Micro Pension Services Private Limited (IIMPS), the economically poor community can now be ensured a financially strong future. Having started as an idea to give a chance to the poor and marginalized working class to live a comfortable life, the company has benefited over one million people so far. The idea came to Bhardwaj’s mind when he started working with the government for a project focused on old age social and income security (OASIS). When the government launched the National Pension Scheme (NPS), Bhardwaj realized that it was only for government employees, and out of the 300 million people that came under the informal working sector, only six to seven percent were eligible to get the pension. “Also, the government would pay these pensions out of tax money that they deducted from the general public’s pocket. And the government employees who were getting this pension benefit already had good salaries and were not poor. So the facility was not reaching out to those who actually needed it,” Bhardwaj says. Later on, the government started deducting 10 percent from the employee’s salary for the pension and the scheme was also opened for the rest of the country in 2009. “Generally, people have the mentality that marginalized people don’t save or do not find the need to save for the future. We wanted to check if that’s the case, so we did a survey to check the demand of a micro pension programme for the poor,” he says. And, within four months they had 25,000 registrations for the micro pension scheme. Bhardwaj knew then and there that he had to make this idea work and engage more people. IIMPS enables marginalized people to save small amounts. “Most of the time, even when a poor person wants to invest in a scheme like this, they do not know how to approach it. They don’t have a bank account or a proof of permanent residence and are clueless about the formalities, unlike most of us who have a relationship manager at our banks to take care of everything,” Bhardwaj says. IIMPS is bridging this gap by collaborating with state and central government, UTI AMC , SEWA, national/regional banks, microfinance institutions, employers, self help groups, NGOs, cooperatives, worker associations and unions. The biggest issue arises when it comes to collecting the payment. Unlike the higher income earning community that can deposit in lump sum and an agent can collect it from their homes, most of IIMPS’ clients are daily wage workers and are unable to deposit a big amount and no agent is ready to go and collect such a small amount from their homes. “The agent won’t take so much trouble if he gets a 2 percent commission on Rs.200 that a person is depositing. Also, there is a risk of theft – how does anyone make sure that the agent is actually depositing the money in the pension accounts?” says Bhardwaj. There was a need to implement a simple, safe and trustworthy platform where the poor could easily deposit their money. To solve this issue, IIMPS implemented payment by card. The client is given a prepaid card which is mapped to his or her pension account. They can go any time to a designated shop, pay the amount they want to put in the pension account by cash, and the shopkeeper would swipe the card with the same amount. The user will get a message instantly. And hence the card is mapped to their insurance account; there will be no chance of theft or misuse of the money. Pension which was considered as a thing for elite, can now be enjoyed by poor as well. Another interesting initiative which Gautam has launched to enable the poor to get pensions is Gift a Pension, an initiative of the Micro Pension Foundation, which is a not for profit entity set up by Gautam and a few other promoters from IIMPS, in 2012. The Foundation designs, tests and main-streams technology led solutions to deliver financial services to the low income informal workers. Gift a Pension initiative enables employers to open a pension account for their domestic helps, drivers, gardeners, etc. The key role of the employers is to explain the scheme and do the initial formalities of opening an account for their employees as this is the biggest hurdle that they face. The employers can also co-contribute to the pension if they want to. Anyone that falls under the age group of 18 to 55 can open an account which falls under NPS-Lite Swavlamban account, and access to an SBI Life insurance cover of Rs. 30,000. Users will get the entire amount at the age of 60. Even if a help changes jobs, the new employer can continue to co-contribute towards the helper’s pension account.Also, there is a multilingual helpline (080-23014545) where all the queries can be addressed. Launched in September 2014, this scheme has already received over 1200 employer registrations and 450 enrollments. “The idea is simple. We want to provide services to the poor similar to those which the wealthy get. The only difference is that instead of investing a high amount, these people invest in small parcels. It’s like instead of buying a shampoo bottle, they are buying a sachet; the quantity is less but the product and the quality is the same,” Bhardwaj says. For more details on how to gift a pension and what are the formalities required, contact Parul Seth Khanna at parul.khanna@micropensionfoundation.org or check out their website. Gift a Pension scheme requires employers to help their domestic helers open a pension account. 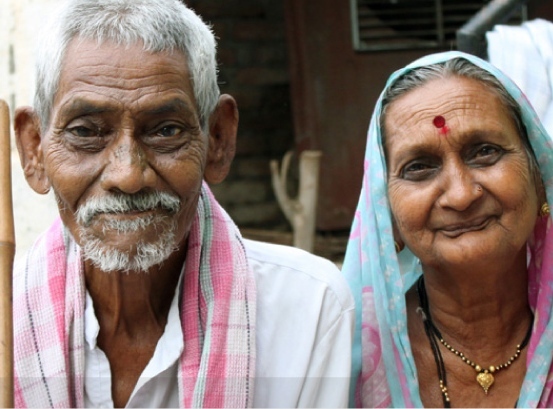 To extend help to people with very low income, who can barely manage to invest any substantial amount of money, IIMPS has been associated with the government’s Vishwakarma Micro Pension Scheme in Rajasthan where they are co-contributing the pensions. For every Rs.1,000 a client invests, the government adds another Rs.1,000 to it. “This provides consistency in the payment. People are willing to somehow save so that they can avail the extra benefit,” Bhardwaj says. The challenges faced by Bharsdwaj were many. As this was a first-of-its-kind initiative, there were no precedents to learn from and everything had to be done from scratch. “We didn’t want to do quick fixes. We wanted to make people aware and increase the financial literacy in the country,” Bhardwaj says. Also, he realized that even the pension agents who would explain the scheme to the clients, were not very well aware of the schemes and the product. To solve this issue, IIMPS started giving training to the agents as if they were customers. “We asked them to understand the scheme as if they were using it. They asked questions which any customer would ask. This is how we enhanced the understanding of the products among our staff,” he says. Other challenges were to solve issues related to collecting the cash and enabling users to continue the investment even when they relocate. To solve the issue, the prepaid card payment system was launched. “We want people to save more and more. We are gradually seeing an increase in awareness but there is still a long way to go,” Bhardwaj says. With all these solutions in place, IIMPS’ clients are more persistent and regular in paying the installments as compared to the government schemes. IIMPS has 40 to 45 percent persistency rate as compared to the government’s NPS, which has 15 to 17 percent. The card system of investing has built trust and confidence among people. By working with the state and central government, IIMPS has managed to increase the impact of existing programmes. They are currently working in around 120 districts of 14 states in the country and hoping to expand further. “We definitely would want to engage with more people and work in more districts,” Bhardwaj says. Apart from getting people sensitized about micro pensions, IIMPS wants to work in the field of insurance too. The amazing micro pension scheme has enabled hundreds of thousands of marginalized people to secure a safer and financially strong future. You can also help by gifting a pension to your helpers today. To know more about IIMPS’ work, check out their website. Now, an easy way to get your money out of dormant PF account. While shifting jobs, many employees don’t transfer their Employee Provident Fund to the new organisation as they either forget or find the procedure too complex. The numbers are surprising. As of last financial year, about Rs 26,496 crore of provident fund money was lying with Employees Provident Fund Organisation (EPFO) in inoperative accounts. The government body stops crediting interest to those accounts which fail to make contributions for 36 months continuously and classify them as inoperative or dormant. Until now it required lot of paperwork like filling up forms and attestation of claim from previous employer and so on. This has changed now. From January, the retirement fund body has launched a special drive to help such account holders. The organisation has asked field offices to identify the beneficiaries of inoperative PF accounts and settle those either by making payments, or transferring money to their active accounts. And to help them in this process, EPFO has launched an online helpdesk. All you need to do is log onto EPFO’s website www.epfindia.com. Under the section ‘For Employees’ there’s a link to ‘Inoperative A/c Helpdesk System’. You need to put in your details and the organisation will communicate you the further procedure. The web helpdesk is meant to help EFPO members trace out their provident fund numbers or find the total fund accumulated. The organisation has seen that the biggest problem with subscribers is that they don’t remember their account numbers. When you click the link, it first asks to fill in the problem. Then you have to fill in details such as the name of the employer, PF account number, date of joining and leaving the company, personal details and so on. One done you will receive a reference number. Make sure to make a note of it as it’s not communicated through email or mobile. If the details are traced, then the helpdesk will guide the subscribers for transferring the amount lying in inoperative account to their existing accounts. The subscribers can also withdraw money from the inoperative accounts by filling the claim form. EPFO has a web facility which helps users to transfer their old account dues to existing accounts. Account holders should immediately act if they have not transferred or claimed provident fund when they changed jobs. PF is the key to retirement planning. “Even if a person has not earned interest for a year or two, it can drastically impact retirement corpus,” said a certified financial planner. He also suggested that it’s better to transfer the balance to the new account rather than withdrawing it. It’s not just about losing interest and consequently not benefitting from power of compounding. Dormant accounts can be targets of fraudsters. For example, two years back EPFO discovered that fraudsters siphoned off money from inactive PF accounts by forging documents and by opening bank accounts using forged identity documents. This was prominent in establishments where remittances had not been received for many years, records not updated and the establishment had not submitted statutory returns. You would have heard and read about how the young average age of the Indian population is advantageous for the Indian economy. While there is no doubt about this being true, it is expected that this average will increase in the future leading to a larger population in the 60+ age group making retirement planning more important than it is currently considered in India. According to the latest UNFPA report, the number of Indians above 60 years is expected to rise to 55% by 2050. The longevity of life is also expected to increase with a more active post-retirement life owing to betterment in medical facilities. This means that tomorrow’s retirees will have a longer retirement life and must therefore accumulate a bigger corpus for their sunset years. The way to ensure this is, good retirement planning. The scheme offers two kinds of accounts namely, Tier I and Tier II accounts. Tier I account is mandatory for a subscriber of the NPS, whereas Tier II account is optional in nature. One can open a Tier II account only if he has a Tier I account. Major difference between the two accounts is that in Tier I account, there are restrictions on withdrawal whereas, a subscriber is free to withdraw money from the Tier II account. The minimum annual contribution for Tier I account is Rs. 6000, which can be paid at once or in installments of at least Rs. 500. The minimum contribution in Tier II is Rs. 250 per transaction and at the end of a year, the minimum balance in this account should be Rs. 2000 or else the subscriber is liable to pay a fine. Click Here for the full detailed article, along with Tax Benefits, Norms of Withdrawal, Charges, FAQs, etc.